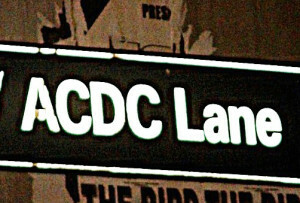 Ten years ago, it was done illegally, today it will be official: ACDC lane gets its thunderbolt … Photos soon peeps! Erecting expensive metal work with a hammer drill, at a height of 12ft in the pouring rain might not be your idea of artistic expression. But it certainly was for Knifeyard on Tuesday 2nd November. 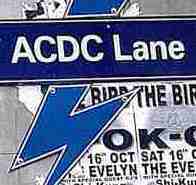 On October 1st this year, the City of Melbourne council renamed Corporation Lane: ACDC lane. Although there was attempts to have a lightning bolt separator between AC and DC, so as to correctly represent the band’s name, there is no legislation for anything other than letters to be on street signs –and the legislation was not going to be changed. By 9pm that same evening, courtesy of Knifeyard –a thunderbolt was added, though it did not last long.